Jeanne Veillette Bowerman wrote an article on the Script Magazine website, profiling two of my very favorite Twitter buddies, Julie Keck and Jessica King, a writing team collectively known as King is a Fink. Julie and Jessica have been incredibly successful building a social media presence, and it’s led to some real successes that otherwise may never have been available to them. Twitter is where they met many of their future collaborators. Starting with director Phil Holbrook. Phil enjoyed King is a Fink’s tweets and short films enough to invite them to write a screenplay for him (yes, you can show both humor and a writing voice in only 140 characters). 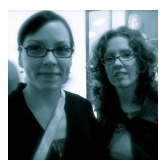 In 2010, Julie and Jessica turned Phil’s idea into a feature-length screenplay, crowdfunded the project, and jetted through the production of TILT that September. TILT is now in the loving hands of Phil and editor Jeremy Doyle. Godspeed, fellas! But what got them started? Julie and Jessica looked up some of their favorite non-produced screenwriters, starting with Chip Street, and found he had a website where he marketed not only his projects, but also himself as a writer. They snooped around more writers’ websites and were surprised many were on Twitter. Screenwriters could actually market themselves? Bingo! And just like that, the girls drove Thelma and Louise-style off the cliff and into the waiting arms of a glorious filmmaking community. I am humbled at the mention, and very much appreciate the nod from these amazing Twitterati and damn fine writers. Take this as a lesson… social media works. In ways you never expect it to. Follow Jeanne Veillette Bowerman on Twitter.